Boss Keith Curle has labelled young Cobblers striker Joe Iaciafano ‘a livewire’ and says he is keeping a keen eye on his progress, but believes the player still needs more loan experience. Currently on loan at AFC Mansfield, academy graduate Iaciofano has scored 11 goals for the Evo-Stik League First Division East outfit since joining them at the beginning of December. In recent weeks, 18-year-old Jay Williams has become a key figure in the Town first team, while 17-year-old Scott Pollock was recalled from his loan at St Neots to take a seat on the bench for last Saturday’s 3-2 defeat at Cambridge United, getting on for the injured Shaun McWilliams in the first half. Iaciafano is now 20 and has been a big hit with The Bulls, and some fans and observers would like to see him given a first team chance as well, but it appears he is not yet knocking on that particular door. But he is very much in the manager’s thoughts. 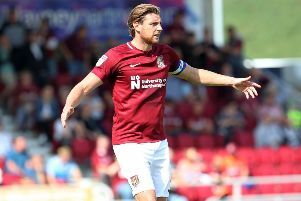 Northampton-born Iaciofano has been a professional for more than 18 months now, but his first team appearances have been limited to three substitute appearances in the Checkatrade Trophy, and two late, late introductions from the bench in the FA Cup loss at Stourbridge and league one trip to Sheffield United in late 2016. He is currently on loan at AFC Mansfield with another Cobblers youngster in Sean Whaler, and Curle took time out to go and watch the pair play earlier this month when Town’s Sky Bet League Two clash at Tranmere Rovers was postponed. Curle admits he was happy with what he saw, but hinted Iaciafano could soon be loaned out to a club higher up the football pyramid than step eight where he currently plays, which is the same level as Town’s county neighbours Corby Town. “Joe scores goals, and I think it was important for him to go out on loan,” said Curle. “I have seen him in training, but that game I went to was a good opportunity for me to go and see him play (Curle saw AFC draw 0-0 with Tadcaster Albion). “You can tell he is a livewire, he comes alive when the ball is in the box and he is always on the move. “Joe didn’t get many opportunities, and I think word has already spread within that division that if you give him an opportunity he will score, so most of the time he had two men on him. As for Whaler, Curle said: “They both competed very well within the team framework of how they were set up. “For Sean, it was a game where he had to stand up to the physical aspects of the game, which is why he is there. Curle enjoyed the chance to go and watch two of his young squad members in a competitive environment, and says it is something he and his coaching staff like to do, the ensure the players who are loaned out know they are still very much Cobblers players. “It was a good exercise for me to go and see Joe and Sean play, and it shows that when we send a player out on loan, they are not out of the building,” said Curle. “They are out for a reason, and it is a good opportunity for us, as even with the younger players that go out on loan, Kieran (Scarff, academy director) and Jon (Brady, under-18s manager) will be out monitoring them so we get good updates.